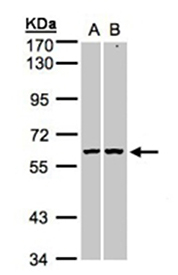 Immunogen: Recombinant human PARP-3 (aa 63-330). Formulation: Liquid. In 0.1M TRIS, pH 7.0, containing 0.1M glycine, 10% glycerol and 0.01% thimerosal (preservative). Scientific Background: PARP-3 is part of the PARP family of enzymes that modify nuclear proteins by poly-ADP-ribosylation, which is required for DNA repair, regulation of apoptosis, and maintenance of genomic stability. This gene encodes the poly(ADP-ribosyl)transferase 3, which is preferentially localized to the daughter centriole throughout the cell cycle. Alternatively spliced transcript variants encoding different isoforms have been identified. Western blot analysis in whole cell lysates of (target) in lanes A). A431 cells [30 µg] B). HeLa S3 cells [30 ug] using PARP-3, pAb (Prod. No. ALX-210-971) at a dilution of 1:1000. 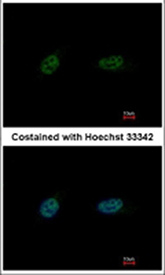 Immunofluorescence analysis of paraformaldehyde-fixed HeLa cells using PARP-3, pAb (Prod. No. ALX-210-971) at 1:500 dilution. Western blot analysis in mouse heart cell lysate [50 µg] of PARP3 using PARP-3, pAb (Prod. No. ALX-210-971) at a dilution of 1:1000. 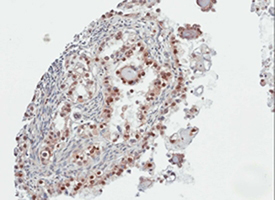 Immunohistochemical analysis of paraffin-embedded OVCA tissue using PARP-3, pAb (Prod. No. ALX-210-971) at 1:100 dilution.